How Much Does It Cost to Install Drywall in 2019? 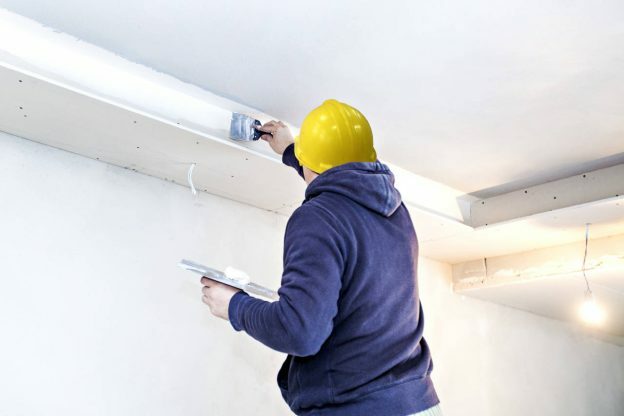 Drywall or sheetrock is the gypsum product used to replace the lath and plaster method of covering a wall in preparation for paint, wallpaper, or other finishes. How much it will cost to install depends on if you are installing new board or replacing old or damaged drywall, how much labor costs in your area, and the level of finish you want with your installation. The cost is usually in the $1,000 – $2,500 range. Typically, sheetrock costs $1.25 – $3.00 per square foot to install. A small area will cost more than a larger area per square foot because the contractor will still need to pay for transportation, permits if required, etc. However, once you add in all the other materials, like joint compound, drywall screws, tape, and labor, it could cost as much as $40 – $50 for each full-size sheet. After determining the dimension of the area you want to get covered with drywall, and you know how much you pay for each panel, enter those figures into our handy drywall calculator. It will tell you how many boards and materials you will need to buy. Let’s say you have a 10’ x 12’ room with an 8’ ceiling and the ceiling needs drywall too. Once you put that information into our calculator and click on calculate, you will see that you need 15 sheets of 4’ x 8’ drywall, three pounds of screws, three rolls of 100’ tape, five gallons of lightweight ready-mix joint compound to cover the 472 square feet. So, using the square foot figure, it will cost $590 – $1,416. Just $300 of which will go toward the drywall panels. If you have the time, tools, knowledge, and some assistance, you can do this as a DIY project. You can usually get a better deal on 4’ x 12’ sheets and then cut the sheets in half, especially for the ceiling where you will have to hold the panels in place at least long enough to get a few screws in it. If you have never installed drywall, you could check out some YouTube or other DIY videos, or when you need it done right the first time, contract an installation team. Now all you need is an installer, right? Get free estimates by entering your zip code on our Find Qualified Drywall Professionals in your Area page. But, before you run off to find installers, you will need to tell them what level of finish you want for your install. Most people have no idea there are different levels of finish when they tell the contractor they want drywall installed. Well, they might consider they want the wall ready to paint or cover with wallpaper. There are six levels, but only five provide any type of finish. At level zero, you will only get it installed and nothing more. This is the most expensive option and requires the least amount of work by the homeowner. The customer usually needs to specifically ask for this level, because on top of the three layers of joint compound, the drywall gets a light coat as well. The intent is that nothing shows through and paint doesn’t sink into the board. Level four gets three coats of compound, but the board itself does not get coated. This level is best when the owner will prime the walls before painting. This level is acceptable for heavy texture with just two coats of the compound but should not have any tool or ridge marks. This level is suitable for wallpaper. This level usually is appropriate for areas you don’t intend to finish, such as a garage or unfinished basement. You will get one coat of compound. This level is also useful when you intend to add tile. Joint compound will cover the tape and not much more. This is good for rooms you don’t intend to use such as an attic or water heater closet. With this level, you will get your drywall hung. Nothing gets covered, no tape, and no compound. This level is acceptable for a low-budget DIY project when you wish to finish the room your way. The higher the level number, the more work is required; therefore, the more the contractor will charge to finish your drywall project. When you get to that step in the finishing process, consider our room paint calculator or room wallpaper calculator. Considering how much each will cost, will give you a better idea which finish level to choose after examining your total budget. We suggest getting several estimates for your project to find the contractor to work with that meets your budget and project requirements. You can find contractors online, or alternatively, you can ask your city’s building inspector’s office or the Better Business Bureau.